It’s no surprise that the new iPhones are arriving next month. And as always, there are three things to do once you decide to buy one: pick your color, choose your carrier, and back up your old phone. But if you’re on the free iCloud tier, that last one might be difficult since Apple still only grants 5 gigs of free space to each iCloud user. So if you take a lot of pics or have more than one device, you’re probably not going to have enough space to back up everything you need to take to your new iPhone. 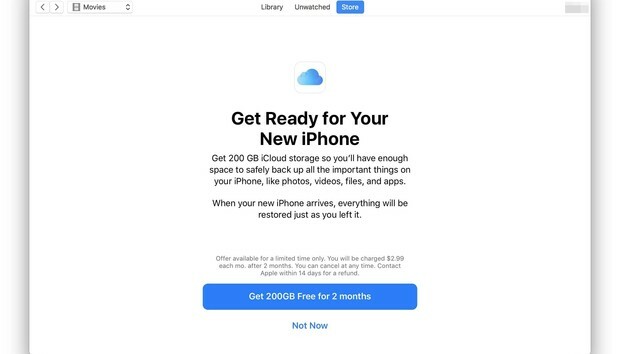 That may be why Apple is enticing users to upgrade to a paid plan by offering 200GB of iCloud space, 40 times as much storage as the no-cost tier, for free. Some major strings are attached, though. As first spotted by an eagle-eyed Redditor, the offer is currently only valid for subscribers to one of the major carriers, as the offer link only works for Sprint, AT&T, and T-Mobile. Once Apple officially announces the program, however, Verizon is likely to be included, as well as smaller wireless providers. There are more caveats. First and foremost, you need to be a new iCloud paid storage user, so if you’re already paying for storage, you can’t take advantage of this deal. Finally, it’s only for a “limited time” and expires after two months, so you’ll need to either keep paying or cancel before the free period expires. The good news is you’ll be saving a whole $6 on what the 200GB tier would normally cost for two months. And with the largest iPhone topping off at 256GB of storage, it’ll be more than enough space to back up even the most stuffed iPhone. To sign up for the free offer, you can follow this link on a Mac or iOS device. If on a Mac, you’ll need to running iTunes 12.7.1 or later, and you’ll be given a unique code that you can redeem for the free storage. Why this matters: They say you shouldn’t look a gift horse in the mouth, but I’m staring this one down. Sure it’s nice that Apple is giving all new paid iCloud storage users an extra 195GB of storage for a couple months, but this is hardly an altruistic move. For one, Apple already offers a free month of storage for new users, so you’re really only saving $3. For another, this smacks of a ploy to get people to sign up for a service they’re going to forget to cancel. I’ll admit that 200GB of iCloud storage makes life a whole lot easier, but Apple shouldn’t force users to by paying just so they can back up their phones. Google offers 15GB on the free Google Drive plan, and Apple ought to do the same for iPhone users. Or at the very least offer 5GB of space per device so users have a sporting chance of having enough space to back up. Five gigs just isn’t enough and this promo only proves that Apple knows it.